Yesterday, May 6, 2006, marked the 150th anniversary of the birth of Sigmund Freud. For at least 80 of those years, since 1927, cartoonists at The New Yorker have been making fun of psychoanalysis with the familiar image of the analyst’s couch, therapist and diploma that has become more of a cartoon cliché anything except the desert island. In honor of the occasion, and in celebration of the 80 years of wonderful mockery, the Museum of the City of New York, a city linked with the image of psychoanalysis if there ever was one, has mounted an exhibition of 75 of those cartoons entitled On the Couch; Cartoons from The New Yorker, which runs to July 23, 2006. The Cartoon Bank has published a book of psychoanalysis cartoons, with the same title, that also acts as a catalog of the exhibition. The book is only available at the museum or through the Cartoon bank site. There isn’t an online version or excerpts from the exhibit, but you can create your own virtual exhibit by going to the Cartoon Bank, the New Yorker’s online cartoon division (and subject of one of my first posts), and doing a search in Cartoon Prints for psychiatrist and Freud. 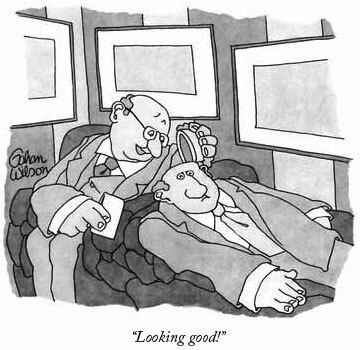 Some of them are as clichéd as the image and subject, but some, like the cartoon by the great Gahan Wilson, above, are “heads above” the rest. I am a regular and grateful visitor here. This time I want to invite you to pay a look at my own interpretation of Freud’s reception into Argentina’s culture.